If you’re a first-time or novice MC then chances are don’t know how to be an MC at a wedding. And you probably don’t understand your duties, role, or responsibilities at the reception. Here’s a short guide for you if you’re the wedding Master of Ceremonies and you want to know how to conduct a reception. We’ll explain several key events throughout the function and give you advice as well as a number of tips that will help you fulfill your duties and responsibilities in a professional manner. Keep in mind that the bride and groom selected you to be their MC because they trusted you and considered you to be the most qualified to help them celebrate one of the most important days of their life. In turn, you should honor the bride and groom by making their celebration a happy memory that they can fondly look back on in years to come. A popular misconception is that the Wedding Emcee is nothing more than an announcer. While it’s true that you’ll make announcements and you should be comfortable speaking in front of large groups, the role of the Master of Ceremonies at a reception is much more than being an announcer. Your role also includes everything that goes on behind the scenes of the reception and involves a huge amount of careful preparation and planning to make this event one that will be remembered. After all, a wedding reception is an EVENT. It’s a time of great happiness for the bride and groom and their families. A time of cherished memories…that will last a lifetime. As you can see, the reception goes beyond mere duties and responsibilities – even though they are part of your planning. If you want an event of this magnitude to be a complete success, you have to be creative – and thorough – with your planning. While this MC At A Wedding Guide you’re reading right now is a good primer to show you what’s involved in planning a reception, you can find a comprehensive guide used by hundreds of Wedding MC’s worldwide that takes you through all of the steps to planning a FUN reception from start to finish in How To Be A FUN Wedding MC. And that’s the key – creating a FUN reception that thrills the bride and groom and their guests with a celebration they’ll remember for years to come. It requires creativity and thought to make the reception not only meaningful but also memorable. That’s why How To Be A FUN Wedding MC shows you how to create a party atmosphere that’s a celebration of the newlywed’s big day. In many ways, your role could be considered to be that of a host. You welcome the guests and you ensure they have an enjoyable and fun time at the reception. More importantly, though, in addition to being a leader, communicator, and entertainer, you’re a coordinator, – the key person who orchestrates what goes on before and during the reception. 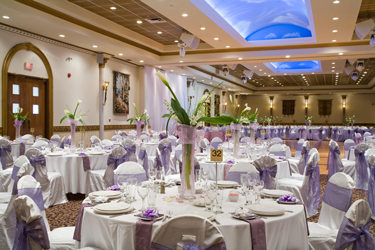 You’ll direct the guests and Bridal party throughout the reception to ensure things run smoothly. And even though the Bride and Groom and the wedding planners have spent many months planning this big day, the responsibility rests primarily with you to make it a memorable and fun time. Don’t forget – the Bride and Groom and their families have also spent many thousands of dollars to make the reception an event of a lifetime. So there’s a lot riding on your doing an exceptional job as Master of Ceremonies. It’s your prime responsibility to have a thorough understanding of the agenda and to co-ordinate the events from start to finish. In some cases, you may also have an assistant who can help you with scheduling and arranging the events on the agenda. It’s critical, too, that you keep all key players informed throughout the reception to ensure things are properly coordinated and run smoothly. A few well-chosen and appropriate wedding jokes during the reception can go a long way to making the event even more fun. 1. Select wedding jokes that are appropriate and don’t embarrass the Bride and Groom or the guests. This includes off-color jokes and well as suggestions of infidelity, cheating, and womanizing on the part of the groom. Even comments – no matter how funny they might seem at the time – about a divorce or the number of previous marriages either the bride or groom has had are inappropriate. Remember, this is a new start for both the bride and groom and their marriage celebrates their new beginning as husband and wife. There shouldn’t be anything said (or done) that takes away from their happy day. 2. Practice your jokes beforehand out loud to get your rhythm and timing right. A wedding joke – like all effective jokes – requires proper timing. Get the timing right and you’ll have a better chance of success and getting the laughs you’re looking for. 3. Make a note of where during the reception agenda you’ll include a particular joke. Your agenda is your guide throughout the reception. So use it to full advantage and note down where you’ll make your Wedding MC Jokes. 4. Stagger your jokes throughout the reception agenda. Keep in mind, you’re not a stand up comedian and you’re not expected to be one. But a few well-chosen MC Jokes can go a long way to breaking the ice and increasing the fun factor at the reception. Like any important function, the wedding reception runs on a schedule from one event to another. This is especially important if the reception venue is reserved for a specific amount of time and heavy surcharges will be assessed if the event runs long. As Master of Ceremonies, it’s your responsibility to ensure that events follow the agenda you’ve helped develop in consultation with the Bride and Groom and the wedding planners. That means coordinating events with all participants and key players – from caterers to entertainers to music providers – and ensuring they are on time. The most effective way of coordinating events is to notify participants and key players at least fifteen minutes before the scheduled event. In that way, there’s less likelihood of delays in proceeding with an event. The reception agenda has a specific timeline that must be adhered to otherwise events will need to be eliminated or shortened to fit within the total time allotted. How To Be A FUN Wedding MC shows you how to quickly and easily prepare a reception timeline and agenda. Plus, you’ll find sample agendas or run sheets that show you how to organize your final agenda, whether it’s a short afternoon reception or a long function that lasts into the early hours of the morning. Even if you’re an experienced public speaker, there are several key elements to running a wedding reception. The microphone is critical to ensuring events run smoothly during the function. Whether the microphone is mobile or fixed, ensure you are familiar with its operation before the function begins. As well, be prepared to show those who will be making speeches and toasts or other announcements how to operate the microphone. What you say during the events should sound natural and unrehearsed – even if you have scripts. Standing in front of 100 or more strangers is not the time to “wing it” or make remarks that are off the top of your head. That’s why it’s essential to have your Wedding MC Scripts prepared well in advance. Your scripts are more than a notation on the agenda that you have to say something. They’re word-for-word scripts that lead you into the next event on the agenda. Write out your scripts and be familiar with what you’re going to say. Major events to prepare scripts for include: Grand Entrance, First Dance/Bridal Waltz, Announcements, Speeches and Toasts, Cake Cutting, Bouquet Toss, Garter Toss, and the Final Farewell. To ensure your announcements go smoothly, it’s recommended that you practice your scripts beforehand – well before you set foot in the venue. Practice in front of a friend or family member to learn the pace and rhythm of your delivery. Take note of any “ahs,” “ums,” and other “fillers” that detract from an authoritative presentation or announcement. If you’ve never practiced in front of anyone before you may feel self-conscious and even uncomfortable at first. That’s entirely natural. But it’s better to feel uncomfortable in familiar surroundings with people you know than to begin the reception “cold” in front of 100 or more strangers who are expecting you to handle everything with professionalism. The Wedding Agenda outlines all of the events during the reception. All of the venue information should have been gathered several weeks prior to the bride and groom’s big day.. This includes checking the venue premises, knowing who the venue personnel are, and knowing where restrooms, smoking areas, and the bar are located. You definitely do not want to familiarize yourself with the venue for the first time on the “day of” – it must be done well before the function takes place. We recommend getting to the venue at least 90 minutes before it starts to ensure everything is in order prior to the starting time. You will want to do “last minute” checks on directional signage, lighting, and microphone(s) and meet with key players, including your assistant if you have one. After all, there is nothing more stressful and embarrassing than finding the room locked as wedding guests start arriving for the big celebration. That’s why it’s important to leave enough time to sort out minor problems before the event begins. It also helps you calm down and get grounded before beginning your duties. One of your first Wedding MC Duties when you arrive at the venue will be to introduce yourself to the key players – vendors, venue personnel, and wedding planners. Some of these key players you’ll have already met as you were planning the reception but as a matter of courtesy and practicality, it’s a good idea to introduce yourself to them again – especially if you have to review anything with them before the events begin. Other key players will include the Bridal Party, members of the bride and groom’s families, and, of course, the bride and groom – who you will already know. If you have an assistant or translator, then this will be the time to meet with them and go over your outline of events. When the Bridal party arrives be sure to introduce yourself and let members of the Bridal party know what will be expected of them as they prepare for the Grand Entrance. Organize the Bridal party in order of introductions. Also double check pronunciations of names of members of the Bridal party as you are organizing their entrance. Ensure the route the Bridal party will be taking to the head table is unobstructed since you want the Grand Entrance to go smoothly and without a hitch. Speeches and toasts are a traditional event at almost every reception. If it’s a short one, speeches and toasts might be dispensed with but usually there’s at least one or two speeches and toasts that offer good wishes to the bride and groom. There is no traditional place during the reception when speeches and toasts are held. Since speeches and toasts can take up a considerable amount of time you should ensure they start and end on time. That means you must organize the speakers beforehand to ensure they’re available when called upon to give their speech or toast. As a matter of courtesy, it’s suggested you let the speakers know when they can be expected to give their speech or toast. Another common misconception is that the MC always gives a formal speech. Occasionally, the Wedding MC will be called upon to make a speech or toast. Normally, however, you will give only your Opening Speech. Any other speeches or toasts by you will be a result of a special request by the Bride and Groom. You should check with the Bride and Groom to see whether giving a Wedding MC Speech will be one of your duties. Don’t amend the agenda unless it’s approved by the Bride and Groom and/or the wedding planners. Of course, there might be minor changes as the reception proceeds – the caterer is late serving the meal, for example, or one of the entertainers takes longer to set up than anticipated. Even though the agenda is flexible, all of your planning should be done in consultation with the Bride and Groom and planners well before the day of the wedding. Last minute changes may occur but they should be minimal and you should keep in mind the budget guidelines since some venues will surcharge heavily for extra time outside the allotted time. As well, other key players have to be advised of any changes and may charge extra for last minute changes. As a final reminder when you’re the MC at a wedding: It should go without saying that you should make sure the Bride and Groom have safe transportation to their destination after the reception – whether it’s a hotel or airport or home. That’s a concise outline of How To Be An MC At A Wedding. Of course, you’ll need a comprehensive guide that takes you from start to finish in planning a FUN reception and creating an event that will thrill the bride and groom as they begin their new life together. So be sure to check out How To Be A FUN Wedding MC for a much more detailed breakdown of your duties and responsibilities – with checklists, preparation forms, games and entertainment ideas, and more – when you’ve been chosen as MC at a wedding. 1. Introduce speakers and invite them to the microphone to give their speech. 2. Discourage “open” speeches where guests are invited to give an impromptu speech or toast. It can lead to embarrassing or inappropriate jokes and comments and embarrass – even humiliate – the newlyweds and their guests. 3. Keep the speakers and toasters to a strict time limit – maximum is 5 minutes unless the speech is particularly poignant or funny (which is usually the Best Man’s speech). Wedding games and entertainment are two highlights that can add fun to the wedding reception. Not every reception has games or entertainment but they can be a wonderful way to increase the fun factor at the function. How To Be A FUN Wedding MC has a select collection of more than 50 FUN wedding games, activities, and entertainment ideas that kick the events into high gear. Cake cutting is a traditional event and depending upon the agenda it may follow the speeches and toasts. Again, there is no traditional time when the cake cutting takes place but it is customary for it to take place later on in the reception. Announce the cake cutting ceremony to the guests after first alerting the Bride and Groom and having them gather at the cake table. Traditionally (and symbolically) the Groom places his hand over the Bride’s hand when cutting the cake. Cutting the cake together symbolizes the first activity the newlyweds perform together as husband and wife. Usually guests will take photographs at the cake cutting ceremony. It’s therefore wise to ask guests to refrain from taking their photos until the official ones are taken – especially since camera flashes can spoil an official photo. If there is an official photographer and/or videographer, ensure they get their photographs/video first with an unobstructed view of the couple during this traditional ceremony. In some cases, it’s a good idea to cordon off an area near the cake table and reserve it for the photographer or videographer. One event during the cake cutting is the traditional feeding of the cake to each other. In recent years, smashing cake into the groom’s and/or bride’s face has become popular. 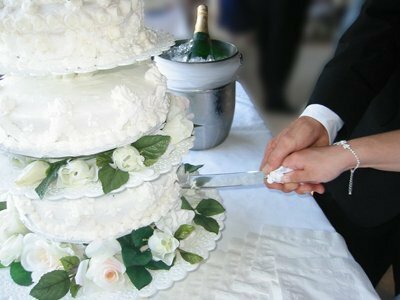 As MC you should be aware from the outset of the bride and groom’s intentions about the cake feeding since some couples prefer a refined and formal reception and don’t want their clothing stained or ruined. The First Dance is significant in that the couple share one of their first romantic moments together as husband and wife. The First Dance requires a formal announcement and co-ordination with the DJ or band to ensure the appropriate First Dance music is played. After the First Dance, there are other Special Dances you can include such as the Bridal Party dance, Father/Daughter dance, Mother/Son dance. Other Special Dances could include dancing with the bride and/or groom’s grandmother and/or grandfather or other close relative like a step father or step mother. If the Bride and Groom have children, the children might also be included in a family dance. After the Special Dances, it’s time to open the dance floor to all of the guests. Allow the DJ or band to take over and encourage guests to dance. Most DJ’s and bands have a special list of games and songs to get guests in the mood and liven up the dance floor. Some receptions don’t have dancing at all. If there is no dancing, there’s no reason why it can’t still be a fun and memorable time since you don’t need dancing to make the function a special time for the newlyweds. Most receptions finish with traditional events including the bouquet toss, the garter toss, and the final farewell. Again, these are entirely optional depending on the wishes of the Bride and Groom. Keep in mind that these events take a little bit of organizing since guests will usually be moving around – either from dancing, mixing with other guests, using the restrooms, having a smoke, or getting drinks from the bar. The Bouquet Toss will usually begin 20 – 30 minutes before the end of the reception – but that’s totally dependent on the agenda. Advise the Bride and Groom at least 10 minutes beforehand. Also advise the DJ/Band leader (so appropriate music is ready) and photographer/videographer. Announce the Bouquet Toss a couple of times so that the single women are gathered for the event. 1. Some guests – whether female or male – may not consider themselves “single” if they’re living together or if they have a partner or if they’re dating. Naturally, they won’t – or may not – consider themselves eligible for the Bouquet Toss because of this. A good rule of thumb is if they’re not wearing an engagement or wedding ring, they’re considered “single” and, in the case of women, they’re eligible for the Bouquet Toss. Be sure to announce this “requirement” when preparing for the Bouquet Toss. 2. You may wish to do a countdown (3-2-1) when the bride is ready to toss her bouquet – it heightens the anticipation and gets everyone ready for the mad scramble for the bouquet. And watch out – there’s likely to be a mad scramble! The Garter Toss traditionally follows the Bouquet Toss. Some newlyweds dispense with the Garter toss. Others make it quite a production with music and encouragement from the guests. As coordinator of the event, you should make sure the Garter Toss is tasteful and not crude or raunchy. The Farewell Circle is particularly popular in Australia but is a wonderfully intimate send off for the Bride and Groom and can be easily adopted and adapted for any celebration. The Farewell Circle is the final event of the reception. If you’re not familiar with the Farewell Circle, guests are asked to form a large circle. The Bride and Groom make their way around the circle in opposite directions, expressing their thanks and saying goodbye to each person in the circle. Halfway through the circle, the Bride and Groom crossover until they come to the end of the circle – where the newlyweds’ parents can be strategically positioned to say their farewell to their children. Sometimes the Farewell Circle is concluded with a poignant song sung by the guests or three cheers are given as the Bride and Groom leave the room. I realize it sounds “easy” to be a Wedding MC. But it’s one thing to tell you what to do and another thing to SHOW you what to do. The fact of the matter is, there is a huge amount of planning that takes place behind the scenes to pull off a fun and memorable reception. In fact, many people who are chosen to MC a wedding don’t know where to start or what to say. And that’s totally understandable since a wedding reception is not an everyday occurrence for most people. Just as importantly, most Wedding Emcees don’t know the key elements that are needed to make the function a resounding success. That’s why How To Be A FUN Wedding MC was created. If you’re a novice Master of Ceremonies at a wedding reception, then be sure to check out How To Be A FUN Wedding MC. It contains numerous checklists – including those for the Reception Venue, Bridal Party, Dancing, Bride and Groom, Introductions, Wedding Speeches and Toasts – as well as MC Scripts, Wedding Games, Sample Agendas (Run Sheets), Contingency Planning, and much more. It’s intended for a wide range of receptions and covers the Order of Events, the Order of Wedding Speeches and Toasts, How to Make FUN Introductions during the Grand Entrance, and How to Introduce Speakers during the speeches and toasts event. This is a hands-on guide the emcee can put to use immediately and has been designed for ease of use. It’s specifically written for the Wedding MC who will be conducting a reception in Canada, Australia, New Zealand, United States, South Africa, United Kingdom, the Caribbean, and English speaking countries in Europe. How To Be A FUN Wedding MC isn’t used just by the Master of Ceremonies. The bride-to-be and the mother-of-the-bride, in particular, see this as a valuable planning resource as they create a fun celebration for their guests. 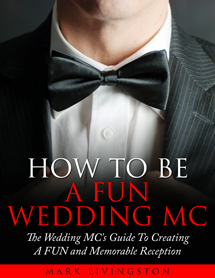 Whether you’re an MC, bride-to-be, or mother-of-the-bride you’re invited to go to How To Be A FUN Wedding MC to download your copy of this comprehensive Wedding MC Guide. Groom Even If You’re A Novice MC! the Mother of the Bride, the Father of the Groom, the Father of the Bride, the Groom, and the Bride. Wedding MC? Wedding Toastmaster? Check out How To Be A FUN Wedding MC and create a FUN and Memorable Reception! wedding reception activities ideas, games, MC scripts, jokes tips, ideas, duties, checklists, run sheets, agendas, and much more!